The Anterior Approach to hip replacement surgery allows the orthopedic surgeon to reach the hip joint from the front of the hip as opposed to the lateral (side) or the posterior (back) approach. This way, the hip can be replaced without detachment of muscle from the pelvis or femur during surgery. The surgeon can simply work through the natural interval between the muscles, in this case the tensor and the rectus muscles. The gluteal muscles that attach the pelvis to the femur, are left undisturbed and, therefore, do not require a healing process to recover from surgical trauma. Leaving these gluteal muscles alone is one of the major reasons why anterior hip replacement patients have less pain and recover faster. The Anterior Approach to hip replacement was first performed in Europe in 1947. Since that time, the technique has been continually refined with advancing medical technology. 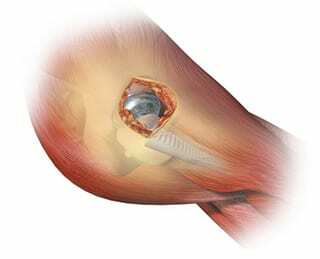 Today, literally thousands of hip replacement patients have benefited from this minimally invasive approach in Europe and America. Dr Joel Matta is credited as pioneering the procedure in this country. After seeing the dramatic results he was achieving and gaining experience with the technique with Dr Robert Gorab in Orange County, I adopted the technique in June of 2008. Since that time, it has become synonymous with my practice. It is truly in my opinion the best way to perform total hip replacement. I use it for every total hip replacement I do. Patients recover faster, leave the hospital earlier, require minimal pain medication and can return to normal function, sometimes as quickly as two weeks. There are certainly less restrictions and less chance of dislocation with this technique. Additionally, and more importantly for the long term, I am able to more accurately size the components and achieve optimal alignment and leg length because of the use of intra-operative fluoroscopy. Conventional lateral or posterior hip replacement surgery typically requires strict precautions for the patient. Most patients must limit hip motion for 6 to 8 weeks after surgery. They must limit flexing of the hip to no more than 60 to 90 degrees which complicates normal activities like sitting in a chair, on a toilet seat, putting on shoes or getting into a car. Simply climbing stairs may also be more difficult during recovery after hip replacement. Anterior Hip Replacement allows patients to immediately bend their hip freely and bear full weight when comfortable, resulting in a more rapid return to normal function. After hip replacement surgery, patients are instructed to use their hip normally without cumbersome restrictions. In supervised therapy, patients go up and down stairs before their hospital release. My patients are leaving a full day earlier than patients undergoing conventional posterior total hip replacement. Additionally, I don’t require patients to use a special toilet seat or a triangular pillow between the legs while sleeping. 30 YEAR KNEE REPLACEMENT BY SMITH & NEPHEW. The brightest minds at Smith & Nephew have worked for years to reduce concerns about a leading cause for knee replacement failure—implant wear. While scientific literature indicates a knee replacement should be expected to last 10 to 15 years before wear becomes an issue, finally, there is a better solution. VERILAST Knee Technology — Knee replacement – a combination of remarkable materials that were tested to simulate 30 years of wear performance. That’s more than twice the length of testing of knee replacements made from traditional materials. In rigorous lab testing, Smith & Nephew’s LEGION CR knee replacement made with exclusive VERILAST technology was subjected to 45 million cycles, or simulated steps. That’s equal to around 30 years of physical activity. The testing showed that after 5 million cycles, the knee made with VERILAST technology reduced 98% of the wear experienced by the knee made with traditional implant materials. And when the LEGION CR knee with VERILAST technology kept “walking” out to 45 million cycles, it reduced 81% of the wear experienced by the conventional knee implant that was stopped after the first 5 million cycles. So while we cannot say we’ve eliminated a leading cause of implant failure for a knee replacement, we believe our 20 years of dedicated research are paying off for patients who would like to rediscover their go after surgery. Click here to read more on the 30 Year Knee.